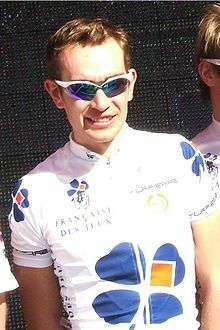 Jérémy Roy (born June 22, 1983) is a French professional road bicycle racer for UCI ProTeam FDJ. He was named the most aggressive rider of the 2011 Tour de France after escaping into breakaways on many stages and continuously attacking from inside the breakaway. Born in Tours, Roy turned professional with FDJeux.com in 2004. During his early career, he continued his studies at the French National Institute of Applied Sciences in Rennes, and graduated in 2007 in mechanical and automated engineering. Despite splitting his time between studying and cycling, Roy still finished 4th in the Tour de Picardie and won the young rider competition in 2006. Also in 2006, he finished 4th in the Châteauroux Classic de l'Indre, then 4th in the Grand Prix de Plumelec Morbihan in 2007 and 5th in the Route du Sud in 2008. 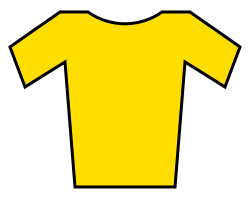 Roy gained his first professional victory on March 12, 2009, when he won stage 5 of Paris–Nice, beating his breakaway companion Thomas Voeckler in a sprint. The following year he won the Tro Bro Leon, performed well in the La Flèche Wallonne and finished third in the prologue of the Tour de Romandie. He won his first race of 2011, the Grand Prix La Marseillaise Open in late January. He began the 2011 Tour de France by attacking on the 1st stage, and again on stage 4, winning the award for most combatative rider for that stage. Roy came agonisingly close to winning stage 13, finishing third after being caught with 2.5 km to go, by Thor Hushovd and David Moncoutié, after a challenging pursuit in the final kilometres. He did, however, gain enough points to take the lead in the classification for the Polka Dot Jersey, and the combativity award once more. He also got in a break on the final stage and spent over 700 km of the race in breakaways. ↑ "FDJ.fr (FDJ) — FRA". UCI World Tour. Union Cycliste Internationale. Retrieved January 2, 2014. ↑ "Chavanel wins Tour du Poitou-Charentes". cyclingnews.com. August 29, 2014. Retrieved August 30, 2014. Wikimedia Commons has media related to Jeremy Roy.